The Walking Dead: March to War is a free-to-play strategy game for iOS and Android by the company Disruptor Beam. Although the game is technically an adaptation of the comics the environments and challenges will feel pretty familiar to TV fans too. This is not the first mobile game to adapt the zombie franchise as it has previously been done by TellTale and their Walking Dead adventure titles and Scopely's The Walking Dead: Road to Survival. The Walking Dead: March to War takes place in the same zombie-overrun United States as the comics, in this case a devestated Washington, D.C. where after the zombie apocalypse the remaining survivors are attempting to rebuild society as they remember it. You will be able to interact with characters from the comics like Rick and Negan by adding them to your council where they will advise you on your next move. The game also has a multiplayer experience that allows you to form alliances with other players where you both fight against and work with each other to take control of scarce resources while fending off the walkers that pursue the living. How do you Access the Map? How do you get Resources? How do you Build a Base? What is the Monthly Survival Boost? 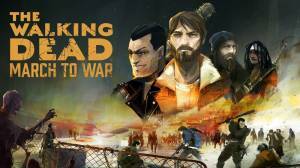 No discussions open for The Walking Dead: March to War at the moment.